At some point, after faithful brushing and flossing, you may visit your dentist and realize that you want to fight a little harder against plaque, cavities, or high periodontal probe numbers. This can be caused by a number of factors. Sometimes people have trouble spots between their teeth where food debris naturally lodges. Regular brushing and even correct and faithful flossing don’t always remove all of the food particles and plaque. As a person ages, they become less dexterous and prone to becoming tired while brushing and flossing, which makes tough-to-reach areas easier to miss. Gums have a tendency to recede, as well. Children also struggle with brushing, even with an electric toothbrush. Food, saliva and bacteria together create plaque, which clings fiercely to the teeth above and below the gum line. A water jet device, such a Waterpik can flush away plaque, not only on the tooth surface, but also beneath the tooth surface in the sulcus. The process of flushing the daily plaque away is like cleaning the boat of barnacles. If plaque can’t get organized, it can’t harden and cause problems. You might be thinking that brushing and flossing alone are enough. You are correct! In many people, brushing and flossing will do a fine job. However, about 47% of the population has some form of periodontitis, which means they might benefit from a Waterpik, either as a preventative or maintenance measure. In older adults, the rate of periodontitis is even higher, over 70%. The pulsing jet of water from a Waterpik is great for cleaning in between teeth and along/below the gum line. Dentists who regularly prescribe Waterpiks report that they can have a profound effect on their patients’ oral health. 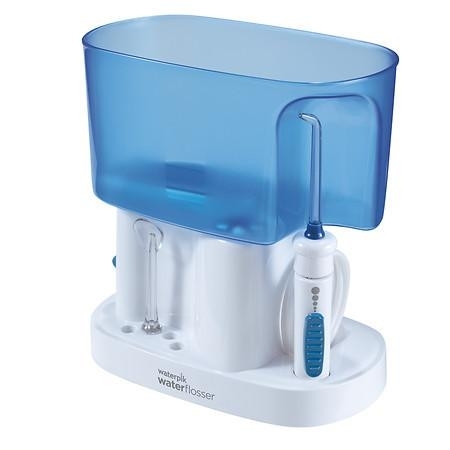 Using a Waterpik once a day in the evening before bed is best. When you first start using a Waterpik, you may find that your gums bleed due to inflammation. The best way to control this is to use a lower setting on the strength of the water jet in the beginning, and gradually build up to the maximum. Over a continuing series of nights, not only will your gums no longer bleed, but it will actually strengthen the sulcus bond and improve your periodontal probe numbers. When you fill the reservoir, you may wish to use a light salt water solution, a capful of hydrogen peroxide (go easy on the amount), or a little mouthwash in with the warm water. Move from the back teeth around to the front teeth on the top teeth, and then back to front and around on the bottom teeth. Stop between teeth to aim and shoot the water jet in all the little spots where food and plaque can form. Take about twice as long flushing between the back teeth as you do the front teeth. Between each tooth space, run that jet of water in a curve along the surface of the tooth at the gum line. This fancy model has an electric toothbrush. Some Waterpik users like to bend over the sink and let the water naturally flow out of their mouth. Others like to purse their lips around the stem of the attachment and hold the water in their mouth until they need to spit, repeating as often as is necessary. The first method is messier, but the second way requires more control. How long should you irrigate between each tooth? You may have certain gaps between your teeth which should receive special attention because you already know they’re ‘food holders’. A good rule of thumb is three to ten seconds between each tooth. People who own the large tank version report that they like to use one tankful of warm water for the top teeth and another tankful for the bottom teeth. A good indicator of where you might want to concentrate your efforts is to ask your dentist for a copy of your periodontal probe numbers. Let them point the way! Remember, using a Waterpik doesn’t negate the need for regular brushing and flossing. But, what it can do that brushing and flossing may not is to flush out hidden pockets of debris and bacteria from between and around teeth and gums before they become plaque.